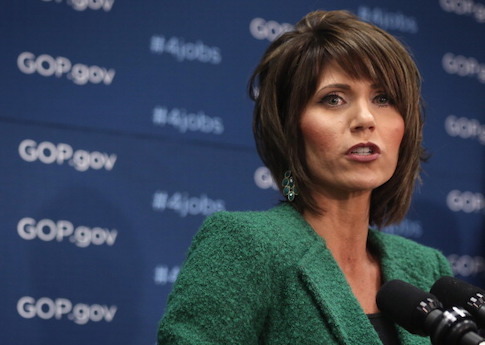 South Dakota governor Kristi Noem (R.) signed the state's permitless carry bill into law on Thursday. The bill, SB47, eliminates the state's requirement that residents obtain a permit in order to legally carry a firearm. Instead, so long as a resident is legally allowed to possess a firearm, they are legally allowed to carry it concealed on their person. Noem said the new law is in line with the country's founding principles and protects South Dakotans gun rights. "Our Founding Fathers believed so firmly in our right to bear arms that they enshrined it into the Constitution," she tweeted. "This constitutional carry legislation will further protect the Second Amendment rights of law-abiding South Dakotans." Everytown for Gun Safety described the law as "dangerous," warned of it having "devastating effects," and urged its members to contact their lawmakers in opposition to it. On the other hand, the National Rifle Association supported the bill and celebrated its passage. The bill passed the state senate by a vote of 23 to 11 and the state house by a vote of 47 to 23. With the governor's signature on Thursday, South Dakota is now the 14th state to remove permit requirements for concealed carry. Twenty-eight other states and the District of Columbia have a "shall-issue" system, in which those who pass background checks and meet other requirements must be given permits to carry. The final eight states have a "may-issue" system where those who pass the checks and meet the stated requirements can still be denied permits by government officials. Several other states are also considering permitless—often referred to by advocates as "constitutional-carry" legislation.